Let’s face it. We are ALL afraid of something. When we were kids, it might have been the dark, monsters, or simply things bigger than us. But now as we get older, we realize that we have much bigger things to be afraid of. We are afraid of rejection, persecution, loss, failure, the future, even the unknown. Sometimes with this world we live in, we are afraid to even walk out of our house alone. In this time it seems like there is only fear that surrounds our everyday life. We may do certain things out of fear, or we may not do something because we are afraid. We let fear control us. We give fear power over us. And you know what? That’s exactly what Satan wants. WE. HAVE. DELIVERANCE. Deliverance literally means “set free.” When we seek and cry out to God, he will set us free of our fear! He will replace our fear with Joy and Peace beyond our understanding. However, if we let Satan feed us lies of fear we allow him to steal that joy and peace. Fear can destroy joy. Simple as that. But, If you are a child of God, you have the power inside of you to move mountains. So how dare Satan try and steal the joy God has placed inside of you? When Jesus overcame the cross, He gave us the power to overcome anything we may face. 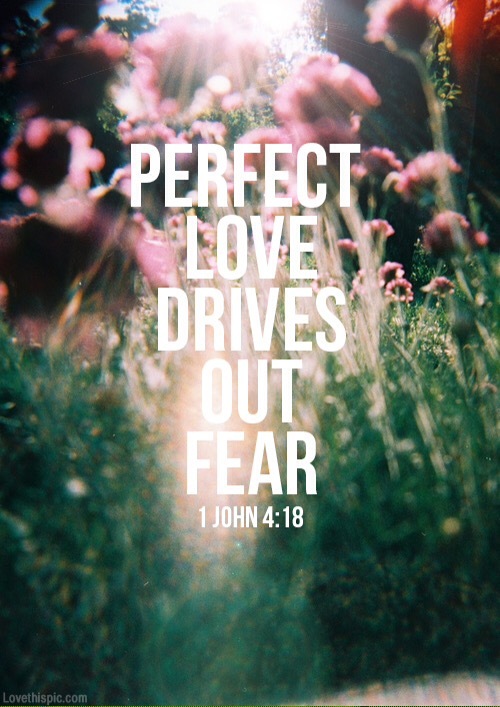 So don’t just pray for God to take away your fear, but speak to your fear. Command it to leave in the name of Christ. You have the power! Hey fam! I hope everyone had a great holiday season! I am sad that Christmas is over but I am so excited for this new year that has come! With this New Year thrown at me (I mean doesn’t it seem like it came out of nowhere?) I have been thinking about what I want to accomplish in 2016. More importantly, I have been thinking and praying about what God has planned for me in the next year! I can also tell that others are thinking about what’s to come in this new year! I see things like, “New year new me” or “Fresh start comes with a New year.” I’ve heard many New Year’s resolutions too; examples would be losing weight or simply being a better person. Some people have picked one word to base their year on, one word that they are gonna live by all year! Personally, I think that’s pretty sweet! Many people have asked me what my New Year’s resolution is and I’ve been asking myself the the same question. I’ve been reading the Word, praying, and really asking God what He would have me change in the new year. In this new year God is making a way for us as Christians. We live in a dry world that is longing for water, longing for a stream. I believe that God is giving us the ability to be that water this world is thirsty for! The negative things that happen all around us seem to cloud what God is really doing. He is rising us up to be a way, a way that points people to the living water. So in realizing this, I have been praying for sight and focus for this year. I don’t want to focus on all the bad things people are doing around the world but to focus on what God’s doing! I believe if we focus so much on the bad it depresses us. Well, I know it does for me personally. It seems like there is no hope. But the Word says in Romans, “And hope does not disappoint us, because God has poured out his love into our hearts by the Holy Spirit, whom he has given us.” HOPE. It never disappoints. So I set my sight on HIM and praise Him through the bad and through the good. For He has given me hope that never disappoints and love that never runs dry. This verse is going to be my theme for the year! I really don’t know what God has planned for me in this new year, but I will watch in hope and wait for God as the verse says. I have also committed to reading the whole Bible in a year; so please pray that I will STAY committed! Throughout this year I also want to Love Unconditionally, Pray More, Worry Less, Be Patient, Be More Thankful, and of course Live Sent. So what is God calling you to do this year? I encourage you to pray about it and seek God in it! Praying that this year is gonna be a great one in Christ! I am beyond excited while writing this because it is 7 DAYS until Christmas!!! AH! Christmas is my absolute favorite holiday! I love Christmas carols, Christmas lights, giving (and I will admit getting) presents, time with family, and most importantly celebrating the birth of my savior Jesus Christ! Everything just seems better at Christmas! After thanksgiving, I had the chance to take my little sister and some of her friends out for ice-cream one night. I feel like I am always leaving to do something with my friends so I thought I would do something for her! Well we were sitting at Dairy Queen just talking and Christmas came up. We all started talking about what we wanted for Christmas and one of the girls said that all she wanted was canned foods and Bibles to give out to the homeless. I had to make sure I heard her correctly! How awesome is that? I have always known what Christmas was all about, but that night that one girl helped me understand it better. When the wise men found Jesus they gave Him gifts and worshiped Him. What will you give Him this Christmas? Maybe you have never given your life fully to Him! Maybe there is something getting in the way of your relationship with Him and you need to give it to God! Maybe like the girl I was talking about earlier we need to give up getting things for ourselves and focus on others! It may just be giving our God the highest praise for all he has done for us! Whatever your gift might be, give it with everything you have! Our God is worthy of every bit of it! For those of you who do not know what “tbh” means, it stands for “to be honest.” Sometimes someone will post something on social media and say “like for a tbh.” If you like this person’s post, they comment on one of your posts and say what they “honestly” think about you. For a long time, I participated in the “fun” telling other people what I thought (some of the time not honestly) of them and in return had people tell me what they thought of me! Sounds fun right? haha I thought so at the time! But then my mom told me not to do these things anymore. Yes, I was mad. Why? All my other friends where doing them! Why couldn’t I? Well, with some prayer, I found out why. I wanted so badly to know what other people thought about me. I wanted so badly to see what they would say. However, I always wanted to be the kind of person that didn’t care what others thought of me. I didn’t want to live my life to please other people. I wanted to live my life to only please one person. God. By participating in the “TBH” frenzy, I lost sight of that. And my mom was tying to make me see that! So from then on, I stopped. And I don’t miss it at all. Because if I truly care only about what Christ thinks of me, then I DO NOT need to know what another person thinks! To add on with TBH, people have now started to “rate” on social media. “Like this post for a rate” Wait what? People can rate you on your looks, how cool you are, or just how much this particular person likes you. So they give a number on a scale from 1 to 10. Am I the only one who thinks this is crazy? SO MANY PEOPLE participate in this though! Don’t let a number someone gives you on social media define who you are. If you are saved by grace, YOU ARE A CHILD OF GOD! I mean don’t even like the post! You don’t even need the opinion of another person if you are set on living your life for Christ. Now admit it. You just sang that and totally rocked it. HA! So anywayyyyss, sorry I haven’t posted all week! Been finishing up my high school and college classes for Thanksgiving. And PRAISE JESUS thanksgiving break is here! Last weekend, my family lead worship at a camp called Palmer Creek. We have lead there many times before and it has become one of my favorite places to be! It is a small but beautiful campground! The place were we had services was in the center of all the cabins and it is basically a huge pavilion! Here are some pics so you can better understand! One of my favorite places to worship. Behind my drums! I love how the sun shines through the cross during the day! I also love how it shines in the dark! Last weekend we talked about letting go. Letting go of “junk” that holds us back from being all we could be for Christ! It may be that you need to forgive someone for something they did to you. Or it may be even forgiving yourself. You know sometimes I think we can’t let go of things we have done in the past and that keeps us from realizing who God has made us NOW. It may be bad habits that just seem to have a hold on you. The Devil knows where you are weakest and he will use that weakness to destroy your faith and your witness. It’s hard to let go. Sometimes we don’t even want to let go. But the end result is so beautiful. Here is why. The last night at camp the did something that I find so neat. Each student wrote on a card what they needed to let go. What they need t0 give to God and never reach for again. Then, they put the card in a balloon and filled the balloon with helium. After singing a few worship songs this happened. Beautiful isn’t it? I know it was beautiful to watch. Holding nothing back. Letting Go. Giving it to God never to see it again. We had an awesome time at Palmer Creek. God moved in amazing ways! Now here is my challenge to you (and to myself). As we go into thanksgiving break, examine your heart. What is it in your life holding you back from being all you be in Christ? I encourage you to give it to God. Yes, it’s hard. But Jesus is worth so much more than what you are afraid of losing! Hope you have a great Thanksgiving! CHOSEN. Me? Chosen? This is a question I ask myself all the time. How could the God of all the universe choose little old me? Well, I have not figured out the answer to this question. However, I find it so beautiful. Beautiful how He uses us to influence and give strength to others even when we can’t find strength ourselves sometimes. What I struggle to realize sometimes is how am I even worthy to be used by this awesome God? So, I dug into the word! The verse above particularly. SET ASIDE. God has picked us. He has set us apart from all others to be an image of Him in our world. The verse says we are to be a “Holy nation.” What does that mean? Well what do you do when you don’t know the meaning of something? You google it!! Google says holy means, “dedicated or consecrated to God or a religious purpose; sacred.” Dedicated. I think of dedication as loyalty. Where do your loyalties lie? We can be dedicated to sports, a girlfriend or boyfriend, friends, or even a job. There is nothing wrong being dedicated to these, but if they begin to take the place of God then you may need to step back and check your heart. GOD’S OWN. Not only does God choose us and set us apart, He gives us a new identity. I like to think of it as adoption. I see and know personally many people who have adopted children. When adoption like this takes place, the parents usually take in an orphan who had a life of sadness and despair before, but after, the child is given a life of love and happiness. I like to think God does this to us when we become His. We were once broken in darkness, but He adopts us and brings us into His LIGHT. He gives a new name. His own. So even though its hard to understand why an all-powerful God would choose mistake-making people like us, we need to realize that He has given us mercy and sees us as worthy. So are we just going to be frozen and not do anything with this? Or are we going to live sent like we ARE chosen by HIM? I have heard these verses all my life. I have learned them in Bible Drills, studied them in Sunday school, and heard many a sermon on them. However, one word always sticks out to me. Go. Such a simple word, yet so powerful. Go. Jesus doesn’t say, “Think about it and when you are ready go for it.” Neither does He say, “Go, but just do what is comfortable for you.” He says Go. He calls us out of our comfort zone and into a life of faith. So how do we fulfil this huge purpose that God has set us apart for? Well, I surely do not have all the answers, but I am going to share what God has shown me while I have been struggling with this in my own life. I believe the first thing we have to do is be willing to surrender. Romans 12:1 talks about offering up our daily lives as offerings. This means our lives are no longer ours to live. They are HIS. I love The Message version of this verse. It puts so clearly that every aspect of our life is His. There are so many things that can get in the way of this though. It may be certain friends, coworkers, possessions, or even things that go on at home. I know in my life I find myself spending so much time on my phone everyday. God has convicted me about that and shown me that time spent with Him and in His Word is so much more important than seeing who posted another selfie on social media. I still struggle with this all the time. It is hard to give these things up sometimes, but to fully live out God’s purpose for our lives, we have to let go of ourselves and things that hold us back from that. Jesus said in John 17:18, “As you sent me into the world, so I have sent them into the world.” Another thing we have to do is realize that we are sent. Many Christians will say that they do not know their calling. Well I believe that every Christian’s calling is to echo Christ in everything we do, say or think. Also it’s to share God’s word and love to the people around us. You don’t have to be a pastor, Sunday school teacher, or worship leader to share Christ with someone. Jesus tells us to do it everywhere we go. Once we come to this realization, It is amazing how God uses us to bring glory to himself. WE ARE SENT. So I believe we should live like it. We have the power inside of us to change the world. I know that sounds really cheesy but it is true! With God on our side anything is possible! I love in Isaiah 6:8 how Isaiah doesn’t hesitate to answer the Lord’s call. That’s how we should be. No, it’s not going to be easy. But the reward is great! So I ask this question. Will you live sent?